Have you ever wondered what makes an efficient call center or customer support service? Is it only pleasant voice of an operators and politeness? Well, these are very important factors for customers. But the most important is the ability of a call center operator to solve customer’s problems and answer his/her questions. A customer will be only then satisfied when all his problems are resolved and questions answered. From a managerial point of view a perfect call center is a call center that need not much money to be maintained or a call center that can generate sufficient profits (for example by selling products and services). Support efficiency plays an important role in the work of any company or a service producer. If customers have no one to address with their problems or concerns such a customer will leave the company and find another business which will offer support and guidance. What makes customer support efficiency? Taking into account the abovementioned facts, an effective manager should evaluate support efficiency from time to time. This sounds easy, but in practice this process can become very complex. If you call center earns enough money it does not mean that it works perfectly. You are to take into account numerous factors and indicators representing REAL performance of a customer support service. 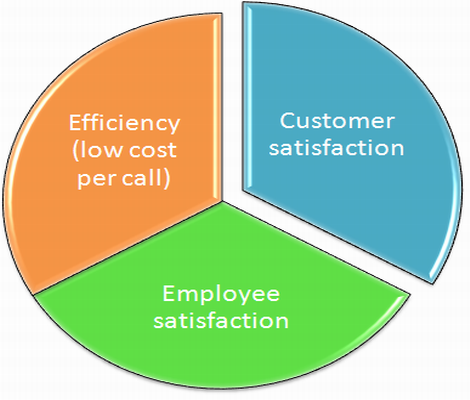 What is the best way to evaluate performance of a call center? This is certainly Balanced Scorecard system. With this powerful tool any manager will be able to see how well his business is performing. Balanced Scorecard evaluates key performance indicators which are different in different business types. By evaluating, for instance, 5 KPI (key performance indicators) it is possible to have a full picture and be well informed on current and potential problems. 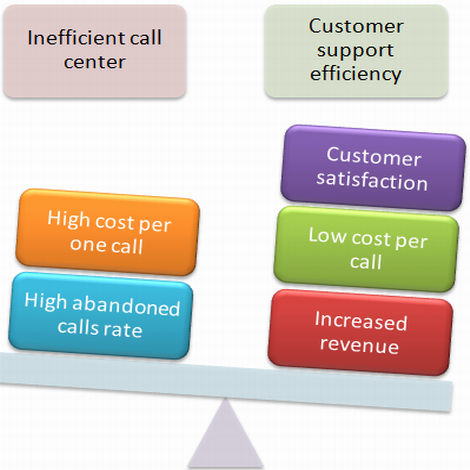 What are major KPIs in the work of a call center and support service? Sure, everything depends on the goals. If a call center aims at selling products and services then revenue per successful call will be a NUMBER ONE indicator. In case of a customer support service, operators need to concentrate on customer satisfaction, abandoned calls rate, time on hold, blockage, cost per call and a number of other KPIs. Balanced Scorecard will provide users with evaluation results in forms of graphs, figures and percents. 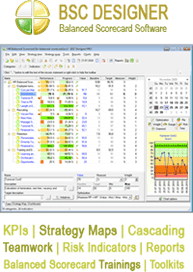 If you regularly use this system it is possible to track change dynamics and analyze trends, which in its turn can help develop strategic plans.